When I was growing up, my dad often assumed Sunday night dinner duty. Which pretty much always meant one of two meals: doctored-up Campbell’s Bean with Bacon Soup and toast or nachos. Macho Nachos, as he called them. Basically, corn chips loaded up with cheddar cheese, olives, and green onions and then we always had salsa and guacamole (“Holy Moly Guacamole.”) I literally did not know that to most other people, nachos meant corn chips with melted nacho cheese, which I hated at first and then stopped resisting and now enjoy with the stipulation that nachos made in the oven with real cheese are always preferable. Unless I’m PMS-ing (keeping it real, peeps.) In that case, give me all the nacho cheese sauce. So believe it or not, my kids have never had nachos, Macho or otherwise. To them, nachos were always and only of the nacho cheese sauce variety. 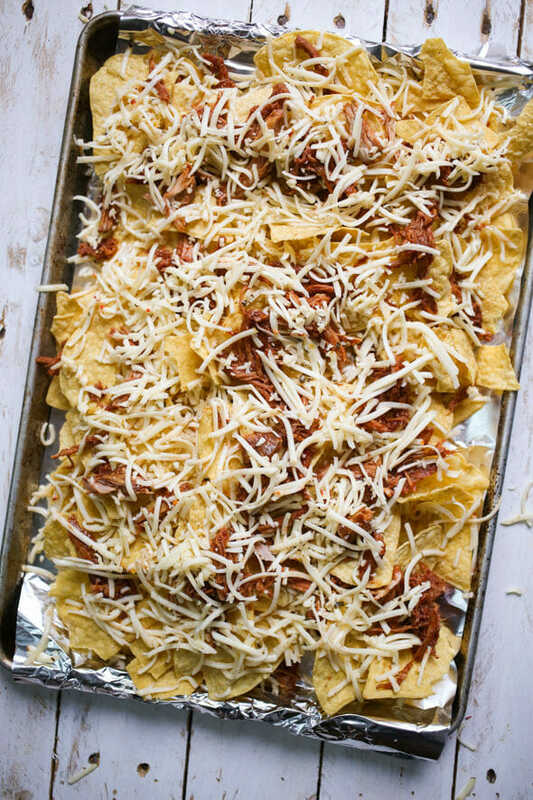 Feeling kind of like a delinquent parent and that I should probably introduce my children to the wonder of oven-baked nachos, and also feeling like we needed to use up the leftover BBQ pulled pork in my refrigerator, these BBQ Pulled Pork Nachos were born. And my children were fans. Like, “Wow, Mom!!! These are really good! I guess you do know how to cook!” good. And I won’t even mention my husband who was literally giddy when he realized we were eating chips and cheese for dinner. Basically, for, like, 30 minutes, I was the coolest person in our house. You’re going to need your favorite corn chips, some leftover BBQ pulled pork (I used the pork from this recipe), a pound of pepper jack cheese (if pepper jack is too spicy for you, Monterey Jack is fine; I will say that we have some wussy tastebuds at our house and when all was said and done, these weren’t too spicy for anyone), some coleslaw (I used this recipe), and some chopped up dill pickles. Preheat oven to 375 degrees F. Line a baking sheet with aluminum foil. Spread half of the chips evenly on the lined baking sheet and top with 1/2 of the pork and 1/2 of the cheese. Repeat with the remaining chips, pork, and cheese. Bake for about 10 minutes or until the cheese is melted and bubbly. Remove from oven. Top evenly with coleslaw and garnish with chopped pickles. 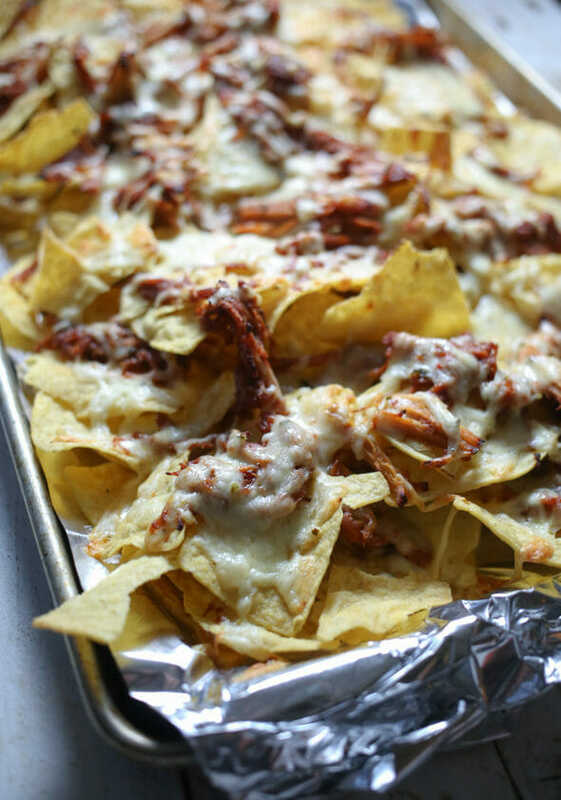 And if you’re still in a pork-y nacho mood, give Sara’s Pulled Pork Nachos with Pepper Jack and Bacon a try! Preheat oven to 375 degrees F. Line a baking sheet with aluminum foil. Spread half of the chips evenly on the lined baking sheet and top with 1/2 of the pork and 1/2 of the cheese. Repeat with the remaining chips, pork, and cheese. Bake for about 10 minutes or until the cheese is melted and bubbly. Remove from oven. 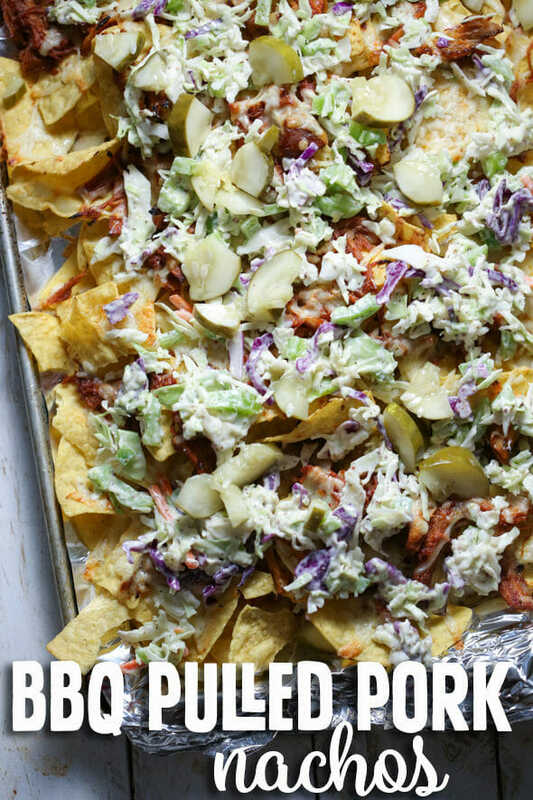 Top evenly with coleslaw and garnish with chopped pickles. Serve immediately. These nachos look amazing! 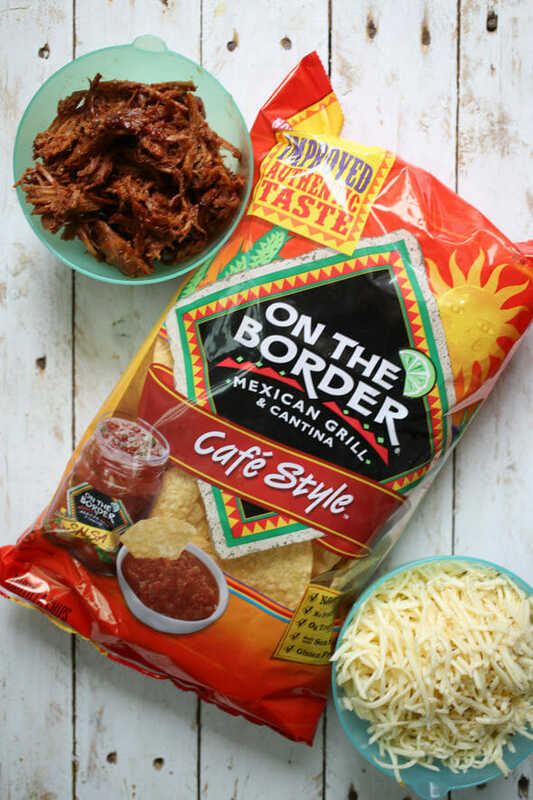 We have left over pulled pork from dinner last night so I think we’ll try making this tonight! Get in my belly! 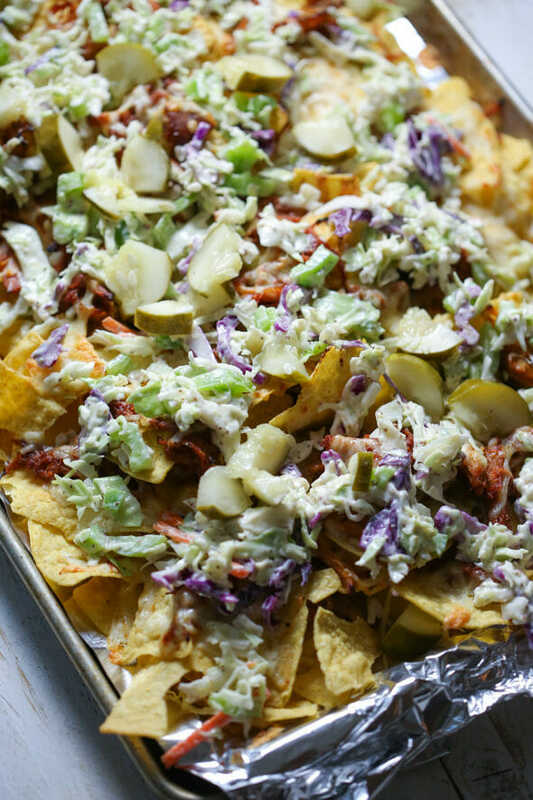 We’re having pulled BBQ pork tonight with coleslaw… I’m definitely saving some for this nacho awesomeness for tomorrow’s lunch. Thanks! Oh my, your kids have never had nachos? Ha. My neighbors would laugh at that. They are usually laughing at me for being the ridiculously protective parent on the block. 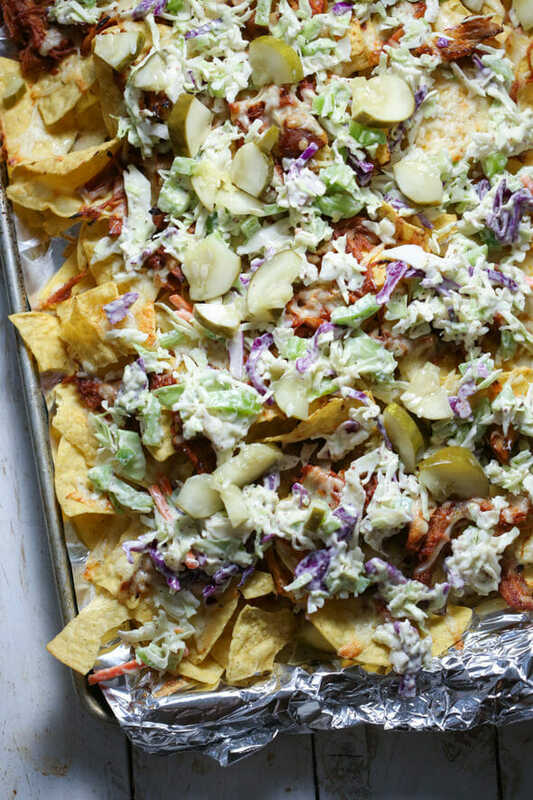 BBQ + nachos = true love always. Cannot wait to give this a whirl. Next Post ❯ Next post: Eat, Pray, Love.